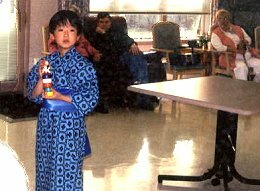 American Living Class Students volunteer every year to give a talk/demonstration of the Japanese culture to clients of Northwest Community Continuing Care Center in Arlington Hts., IL. 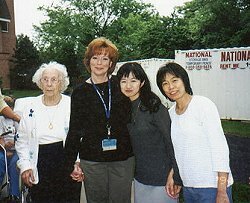 This is a picture of our volunteers, Continuing Care clients and staff. Spring 2001. 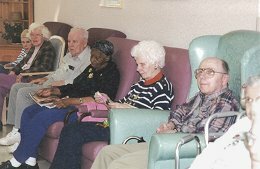 Clients from CCC enjoying the show. Yuri's boy showing us how to play some Japanese games. 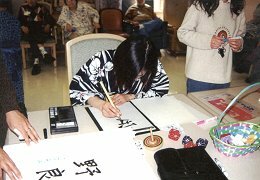 Here is Masako concentrating on Japanese calligraphy. The seniors received some calligraphy as a gift from our students. They did their best to choose the closest characters to the clients names. 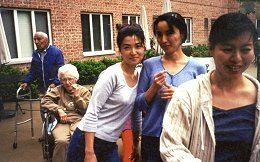 Here is Kayo and Miyoko with a staff member and a client. 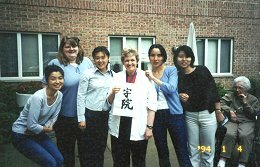 Donna Boyd holding a Japanese Calligraphy that our student made. 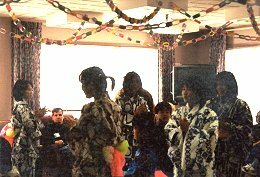 Out students are dancing the "Bon Odori" which everyone in Japan dances at the summer festivals in August. The girls are dressing in their native summer costume called "Yukata".